Purpless Maternity is a new maternity brand designed by Purpless Ltd specially to meet the needs of pregnant ladies. Our pregnancy and maternity clothes will make you feel comfortable and look stylish during this wonderful time of pregnancy. Our aim is to create good quality products that are functional, make you feel feminine and come with a reasonable price. 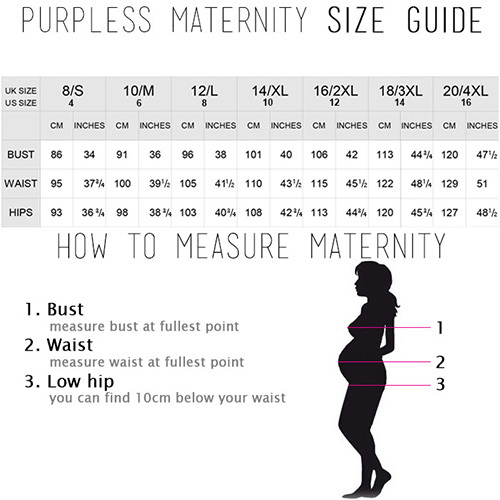 Purpless Maternity is a maternity brand designed by Purpless Ltd registered in UK. We believe that our maternity clothes: maternity dress, maternity top, maternity tunic, maternity leggings, maternity cardigan and maternity skirt will meet the needs of pregnant ladies. Our maternity dresses, maternity tops, maternity tunics, maternity leggings, maternity cardigans and maternity skirts will make you feel comfortable and look stylish during this wonderful time of pregnancy. Our aim is to create good quality affordable maternity clothing that is functional and make you look feminine. We make Purpless Maternity pregnancy clothing available for wholesale: pregnancy dresses, pregnancy tops, pregnancy tunics, pregnancy leggings, pregnancy cardigans and pregnancy skirts. Every pregnancy dress, pregnancy top, pregnancy tunic, pregnancy leggings, pregnancy cardigan and pregnancy skirt comes in variety of colours and sizes. Hope you will love our maternity wear for less! Very stretchy and soft material fits all type of figures. Short sleeves. Ruching on both sides creating lots of space for growing bump. Functional and comfortable, can be worn during and after pregnancy. This top is not only functional, it looks great as well. Colors may slighty vary from the ones showed on the photos. Very soft and stretchy material fits all types of figures. Ruching on both sides creates lots of space for growing bump and you can wear it also after the pregnancy. Perfect for warm summer days or can be worn with a cardigan during colder days. This comfortable maternity top is made of very soft and stretchy material and fits all types of figures. V neckline and lovely bow under the bust area create very feminine look. Ruching on both sides give lots of space for growing bump. Can be worn after the pregnancy during breastfeeding. Perfect for warm summer days or can be worn with a cardigan during coder days. Very comfortable spaghetti strap maternity top fits all type of figures. Made of stretchy and soft material. Ruching on both sides create lots of space for growing bump. This top is not only functional, it looks great as well and can be worn during and after pregnancy. Lovely V neckline creates very flattering look, ruched twist knot detail on the bust gives space for the growing bump. This stylish maternity top is made of very soft and stretchy material and fits all types of figures and can be worn after the pregnancy. Perfect for warm spring and summer days or can be worn with a cardigan or a poncho during coder days. Our basic maternity long sleeved top is made of very stretchy and soft material. Ideal all year round. Ruching on both sides creating lots of space for your baby bump. Functional and stylish, can be worn during and after pregnancy. Great top to wear with a cardigan or a jacket when going out or just simply match it with our maternity leggings to feel comfortable during this special time of pregnancy. Very stretchy and soft material fits all type of figures. Functional and comfortable, can be worn during an after pregnancy. This tunic is not only functional, it looks great as well. Wear it for work, everyday or special occasions. This comfortable maternity 3/4 sleeve top is made of very soft and stretchy materialand fits all types of figures. Ruching on both sides give lots of space for growing bump. Can be worn after the pregnancy.Perfect for autumn and winter days, can be worn with a cardigan during coder days. This short sleeve tunic is made of very stretchy and soft material and fits all type of figures. Functional, can be worn during and after pregnancy, also suitable for breastfeeding mums. This tunic is not only functional, it looks great as well. Wear it for work, everyday or special occasions. Gorgeous Ladies comfortable long sleeve tunic. Detailed neck and tulip style finishing drape. Ruching on both sides create lots of space for growing bump. Made of soft and very stretchy fabric. Make your bump look flattering and feel stylish in this tunic. Wear it with leggings or jeans. Very stretchy and soft material fits all type of figures. Functional, can be worn during an after pregnancy, also suitable for breastfeeding mums. This dress is not only functional, it looks great as well. Wear it for work, everyday or special occasions. This short sleeve dress is made of very stretchy and soft material, and fits all type of figures. Comes with belt, you can tie it either on the back, side or on the front. Functional, can be worn during an after pregnancy, also suitable for breastfeeding mums. This dress is not only functional, it looks great as well. Wear it for work, everyday or special occasions. This comfortable maternity long sleeve dress is made of very soft and stretchy material and fits all types of figures. Ruching on the front under the knot tie gives very flattering look and lots of space for growing bump. Can be worn after the pregnancy. Perfect for autumn and winter days, can be worn with a cardigan during colder days. The item is sold as new with defects, the manufacturer has attached wrong size label. Gorgeous Ladies comfortable batwing dress with detailed neck. Made of soft and very stretchy fabric . Make your baby bump look stylish and feel very feminine. Wear it with tights as a dress or with leggings as a tunic. Lovely v neck maternity dress 3/4 sleeve. Made of soft and stretchy material with extra space for growing bump, ruching on one side gives asymmetric look and makes pregnant ladies look really fashionable. The dress is perfect for work and for special occasions. Beautiful short sleeve maternity dress - a summer edition of our best selling dress. Very stretchy and soft material fits all type of figures. Functional, can be worn during and after pregnancy, also suitable for breastfeeding mums. This dress is not only functional, it looks great as well. Wear it for work, everyday or special occasions. Beautiful new Purpless Maternity summer party dress. Cross over cleavage, stylish shoulder straps with metal embellishment and high back. Elasticated under bust and around back. The dress has been designed for pregnant ladies and gives lots of space for growing baby bump . Perfect for warm summer days or cocktail parties and other occasions. Classic and elegant v neckline and short sleeves. Made of soft and stretchy material with ruching under the bust that creates extra space for growing bump. Pregnant ladies will look stylish, elegant and feel comfortable in this figure flattering maternity dress. The dress is perfect all year round, ideal for work and special occasions. Full length cotton maternity leggings are perfect for everyday wear Over the bump waistband ensures perfect fit and supports your growing bump. Maternity leggings fit all types of figures and can be worn throughout the whole pregnancy Look stylish and feel comfortable wearing maternity leggings with maternity top, tunic or cardigan. Look stunning and feel good in this fabulous warm maternity cardigan. Designed for mums-to-be to keep their bump warm during cold winter days. Two button fastenning, you can wear it with long sleeves or 3/4 sleeves. Ideal for going out, casual and smart occasions. Stylish and modern design. Purpless Maternity floaty waterfall cardigan has been designed for mums-to-be to keep them looking stylish throughout their pregnancy. This long sleeved casual cardigan is ideal for going out. Match it with our maternity leggings and tops to feel comfortable and look fabulous. Elegant loose fitting batwing cardigan poncho in a soft feel fabric Open front with twisted wrap-over middle and 3/4 length sleeves. Excellent match with our maternity tops, vest tops and t-shirts. Create a super flattering silhouette with this simple yet elegant sleeveless maternity dress. Delicate v-neckline, detailed ruched front gives you truly romantic and feminine look. The dress is perfect for casual and formal events, parties, days out with family and friends or hot dinner dates. Our stunning maternity v-neck dress will be sure to draw compliments. Maintain your pre-bump style throughout your pregnancy and breastfeeding with our fashionable and affordable 2 in 1 maternity and nursing top. This long sleeves 2 in 1 top has been designed by Purpless to give you comfort and style during your pregnancy and whilst breastfeeding without spending too much on your pregnancy and post pregnancy wardrobe. We have made sure that ruching on the sides will fit your beautifully growing baby bump. The crossover designed front easily lifts open with one hand to give discreet, comfortable and easy access for breastfeeding. 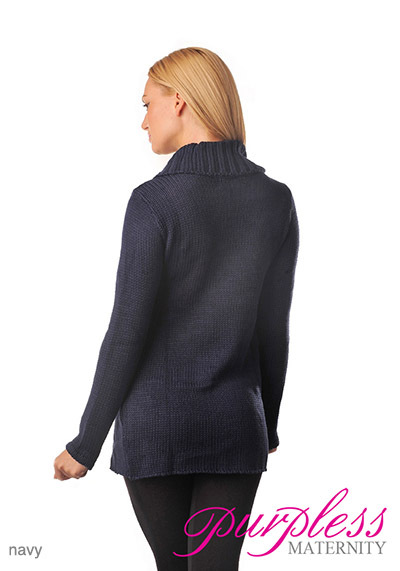 Made of soft and stretchy martial, great with jeans, leggings and skirts. Match it with one of our Purpless maternity cardigans or shrugs during colder days or just wear it on its own - it will always look fab. Elegant and Warm Maternity Wrap Over Cardigan is ideal throughout your pregnancy and beyond. Built in inside and outside knitted drawstring ties allow to adjust the fit around your growing baby bump This lovely long sleeves cardigan has a wide warm collar giving you that stylish look. Our Purpless maternity cardigan makes a useful cover-up after the birth making breastfeeding experience discrete and comfortable. Maintain your pre-bump style throughout your pregnancy and breastfeeding with our fashionable and affordable 2 in 1 maternity and nursing v neck top. This long sleeves 2 in 1 top has been designed by Purpless to give you comfort and style during your pregnancy and whilst breastfeeding without spending too much on your pregnancy and post pregnancy wardrobe. We have made sure that ruching on the sides will fit your beautifully growing baby bump. The v neck crossover designed front easily lifts open with one hand to give discreet, comfortable and easy access for breastfeeding. Made of soft and stretchy martial, great with jeans, leggings and skirts. Match it with one of our Purpless maternity cardigans or shrugs during colder days or just wear it on its own - it will always look stylish. Maintain your pre-bump style throughout your pregnancy and breastfeeding with our lovely and functional 2 in 1 maternity and nursing double layered scoop neck top tunic. This A-shaped long sleeved top tunic will fit your beautifully growing baby bump and the double layered front easily lifts open allowing discreet and comfortable access for breastfeeding. The top is made of soft and stretchy martial and looks stylish with jeans or leggings. Match it with one of our Purpless Maternity cardigans or shrugs during colder days or just wear it on its own - it will always look beautiful. Maintain your pre-bump style throughout your pregnancy and breastfeeding with our fashionable and affordable 2 in 1 maternity and nursing hoodie. This warm, long sleeved 2 in 1 hoodie has been designed by Purpless to give you comfort and style during your pregnancy and whilst breastfeeding without spending too much on your pregnancy and post pregnancy wardrobe. We have made sure that expandable zipped sides will fit your beautifully growing baby bump. 2 discreet, small plastic zips will give discreet, comfortable and easy access for breastfeeding. 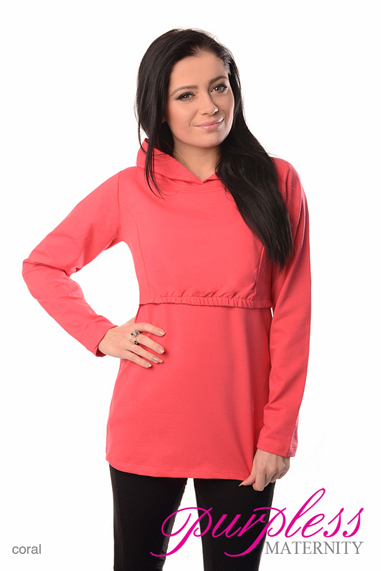 Purpless maternity and nursing hoodie is great with jeans or leggings and will always give you the comfort you need. The model is wearing size 10/M top and is 176 cm tall (78 inch). Full length cotton maternity leggings are perfect for everyday wear Over the bump waistband ensures perfect fit and supports your growing bump. Maternity leggings fit all types of figures and can be worn throughout the whole pregnancy Look stylish and feel comfortable wearing maternity leggings with maternity top, tunic or cardigan. All leggings are brand new with tags, accessories are not included. Our model is wearing size 10/M leggings and is 176 cm tall (78 inch). Go for a statement t-shirt this season with our chic and adorable printed maternity IT'S A GIRL t-shirt. T-shirts are made of comfortable and soft cotton and will last through out your pregnancy. Pair it with our maternity leggings or your favourite pair of skinny jeans and boots. Available in 4 colours. All tops are brand new with tags, accessories are not included. Our model is wearing size 10/M top and is 176 cm tall (78 inch). Go for a statement t-shirt this season with our chic and adorable printed maternity IT'S A BOY t-shirt. T-shirts are made of comfortable and soft cotton and will last through out your pregnancy. Pair it with our maternity leggings or your favourite pair of skinny jeans and boots. Available in 4 colours. All tops are brand new with tags, accessories are not included. Go for a statement t-shirt this season with our chic and adorable printed maternity SKELETON t-shirt. T-shirts are made of comfortable and soft cotton and will last through out your pregnancy. Pair it with our maternity leggings or your favourite pair of skinny jeans and boots. Available in 4 colours. All tops are brand new with tags, accessories are not included. Go for a statement t-shirt this season with our chic and adorable printed maternity INBOX t-shirt. T-shirts are made of comfortable and soft cotton and will last through out your pregnancy. Pair it with our maternity leggings or your favourite pair of skinny jeans and boots. Available in 4 colours. All tops are brand new with tags, accessories are not included. Go for a statement t-shirt this season with our chic and adorable printed maternity LOVE BABY t-shirt. T-shirts are made of comfortable and soft cotton and will last through out your pregnancy. Pair it with our maternity leggings or your favourite pair of skinny jeans and boots. Available in 3 colours. All tops are brand new with tags, accessories are not included. Go for a statement t-shirt this season with our chic and adorable printed maternity LOADING t-shirt. T-shirts are made of comfortable and soft cotton and will last through out your pregnancy. Pair it with our maternity leggings or your favourite pair of skinny jeans and boots. Available in 4 colours. All tops are brand new with tags, accessories are not included. Go for a statement t-shirt this season with our chic and adorable printed maternity BOW PRINT t-shirt. T-shirts are made of comfortable and soft cotton and will last through out your pregnancy. Pair it with our maternity leggings or your favourite pair of skinny jeans and boots. Available in 4 colours. All tops are brand new with tags, accessories are not included. Maintain your pre-bump style whilst breastfeeding with our lovely and comfortable nursing double layered hoodie. This A-shaped hoodie will fit your post-baby bump and the double layered front easily lifts open allowing discreet and comfortable access for breastfeeding. 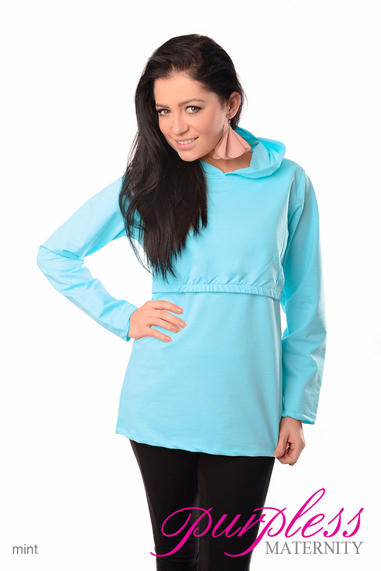 Purpless nursing hoodie is made of soft and stretchy martial and looks great and stylish with jeans or leggings. All items are brand new with tags, accessories are not included. Maintain your pre-bump style whilst breastfeeding with our lovely and functional nursing double layered scoop neck top tunic. This A-shaped short sleeved top tunic will fit your post-baby bump and the double layered front easily lifts open allowing discreet and comfortable access for breastfeeding. The top is made of soft and stretchy martial and looks stylish with jeans or leggings. Match it with one of our Purpless Maternity cardigans or shrugs during colder days or just wear it on its own - it will always look beautiful. All items are brand new with tags, accessories are not included. Top length depending on the size approximately 58-68 cm (23-28 inch). Sleeve length approximately 10-13 cm (4-5 inch). Maintain your pre-bump style throughout your pregnancy and breastfeeding with our fashionable and affordable 2 in 1 maternity and nursing top. This sleeveless 2 in 1 top has been designed by Purpless to give you comfort and style during your pregnancy and whilst breastfeeding without spending too much on your pregnancy and post pregnancy wardrobe. We have made sure that ruching on the sides will fit your beautifully growing baby bump. The crossover designed front easily lifts open with one hand to give discreet, comfortable and easy access for breastfeeding. Made of soft and stretchy material, great with jeans, leggings and skirts. All tops are brand new with tags, accessories are not included. Top length depending on the size between 60-70cm (24-28inch). Maintain your pre-bump style throughout your pregnancy and breastfeeding with our fashionable and affordable 2 in 1 maternity and nursing top. This short sleeve 2 in 1 top has been designed by Purpless to give you comfort and style during your pregnancy and whilst breastfeeding without spending too much on your pregnancy and post pregnancy wardrobe. We have made sure that ruching on the sides will fit your beautifully growing baby bump. The crossover designed front easily lifts open with one hand to give discreet, comfortable and easy access for breastfeeding. Made of soft and stretchy material, great with jeans, leggings and skirts. All tops are brand new with tags, accessories are not included. We require a bank transfer payment for all wholesale orders. Bank details will be provided together with the invoice. No other form of payment for wholesale orders will be accepted. The goods will be shipped within 48 hrs from receipt of the payment in our bank account. Depending on the country of destination it may take up to 10 days for the delivery to be attempted (for Europe destinations up to 4 days). We use UPS, TNT and DPD couriers. Please note that shipping costs will vary depending upon your shipping destination. You can disregard the shipping cost on the automated order confirmation as we will provide you with the correct shipping cost on your proforma invoice. Approximately shipping costs are shown below (excl. VAT). Retuns of wholesale goods are only accepted if the goods are faulty and within 30 days from receipt of the goods, prior notification is required. All returned goods must be in their original condition as delivered to you in original packaging and with all tags and labels intact. Your order will now have been placed and we will review your order, shipping cost and confirm it to you by sending you a proforma invoice/quote with the necessary bank details (the shipping cost may be different to the one provided on the website, the system on the website has been created for small and non wholesale orders, please check our delivery section for the approximate shipping costs). We reserve the right to change our products prices at any time without notice.